I've borrowed some beautiful books from my library lately & I wanted to share some of them with you. They're all books I've been dipping in to rather than reading from cover to cover so, rather than not review them at all, I thought I'd write some mini reviews to encourage you to buy them or suggest them for purchase at your library. 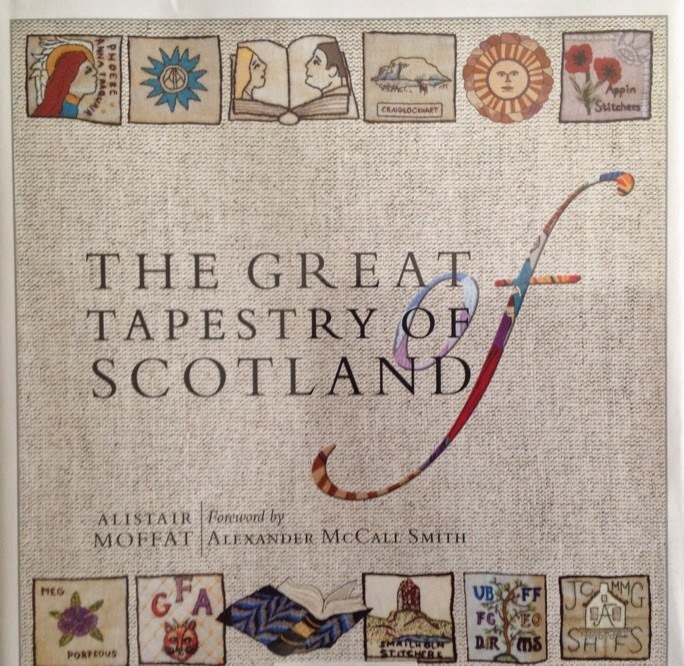 The Great Tapestry of Scotland is the story of an amazing project that was thought up by Alexander McCall Smith after he saw the Prestonpans Tapestry, created to commemorate a battle of 1745. Why not create a tapestry that would tell the story of Scotland's history? He contacted the artist, Andrew Crummy & the project was born. More than 1,000 stitchers from all over Scotland were involved in stitching the 165 panels telling the story of Scotland from the creation of the landmass 11,000 years ago to the reconvening of the Scottish Parliament in 1999. Andrew Crummy's designs for the panels are so beautiful & he left spaces that he hoped would be filled in by the stitchers as they worked. They certainly did fill in those spaces, often with their initials or the name of their group. The panels resemble the Bayeux Tapestry or the illuminated manuscripts of the Middle Ages with animals, plants & motifs in the borders. I have so many favourites, it's hard to just choose a few. St Margaret of Scotland, Haakon's fleet at Kyleakin, Skye (I love the way the figures echo the poses of the Lewis Chessmen), Robert Carey's ride to Edinburgh to bring James VI the news of Elizabeth's death, the Battle of Sheriffmuir in 1715 with the armies chasing each other in a huge circle, Henry Raeburn's Skating Minister, the Forth Bridge, the Herring Girls of the Hebrides & the Isbister Sisters of Shetland. If you read Cornflower's blog, you'll know that she was one of the stitchers of the WWI panel. You can read more about her involvement here. There's also more information about the Tapestry & where you can see it as it's touring Scotland this year here. You can see some of the panels there (although the site's incredibly slow to load). I'd hoped that more of the panels would be on the website but I suppose they want you to buy the book! 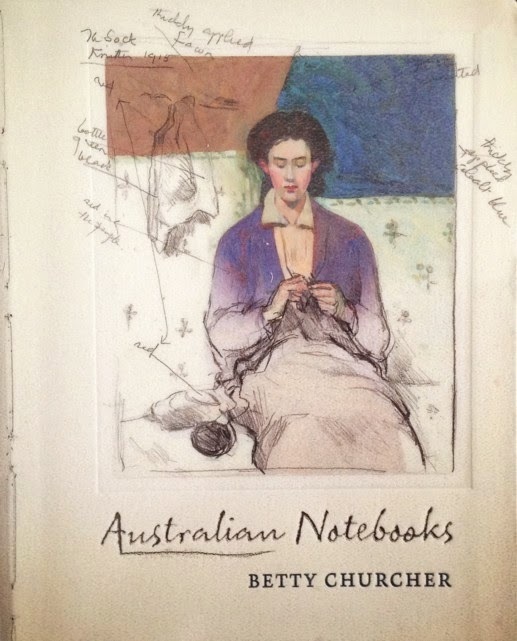 Betty Churcher is a well-known writer on Australian art & was the Director of the National Gallery for many years. Now in her 80s, she has published a series of Notebooks, of which this is the latest. She has visited most of the State Galleries in Australia, visiting her favourite paintings & sketching details of them. As she says, having a pencil in your hand makes you slow down & really observe details. Churcher is a keen observer of the detail in a work of art & the sad fact that she has lost the sight on one eye, only seems to make her more observant. This is one of the most famous paintings in the National Gallery of Victoria, The Banquet of Cleopatra by Tiepolo. 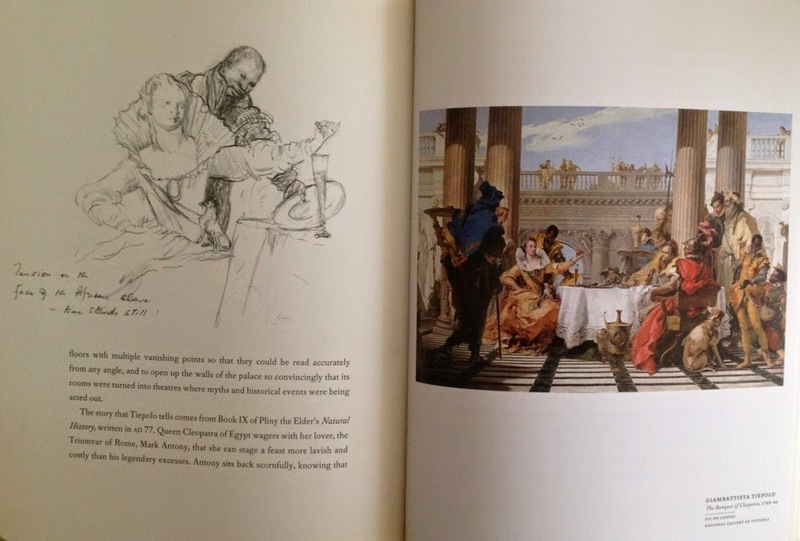 The sketch on the left catches the expression on the face of the slave standing behind Cleopatra as he realises that she is about to drop a priceless pearl into her glass of wine. You can see the painting much better here. Other artists featured include Tom Roberts, Frederick McCubbin, Cezanne, Lucian Freud &, one of my favourites, wonderful Grace Cossington-Smith, whose painting, a portrait of the artist's sister, The Sock Knitter, is on the cover. Apart from the fascinating content, this is a beautifully produced book. It's shaped like a notebook & has a notebook's flexible cover & creamy pages. Jans Ondaatje Rolls has indeed found a way to cast new light onto Bloomsbury, not by yet again re-examining their personal or professional lives, but by walking into their kitchens and dining rooms, unearthing their cookbooks, trying out their recipes (even the less tempting ones) and, above all, by immersing herself in their writings and paintings. Anne Chisholm also mentions that she's working on a new edition of Carrington's letters, which is very exciting as the only other edition, edited by David Garnett, was published in 1971 & is long out of print. Something to look forward to. The book is full of beautiful reproductions of paintings by Vanessa Bell, Duncan Grant & Carrington, photos & sketches of everyone from Virginia Woolf to Lytton Strachey. There are extracts from letters, diaries &, most fascinating of all, are the recipes. 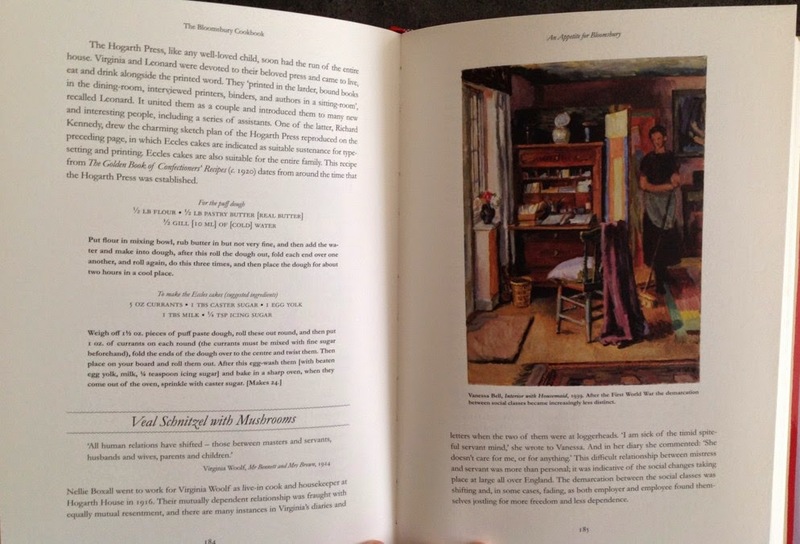 The pages above show Interior with Housemaid by Vanessa Bell (1939) & opposite it, recipes for Eccles cakes & Veal Schnitzel with Mushrooms. As well as using the recipe notebooks of the Bloomsberries, there are also descriptions of similar recipes from cookbooks of the day as well as descriptions of the restaurants they visited at home & abroad & the meals they ate there. Virginia's fraught relationships with her servants are described through trenchant quotes from her diaries & there are the social changes that led to Frances Partridge becoming a very good cook after the war when cooks were hard to find. 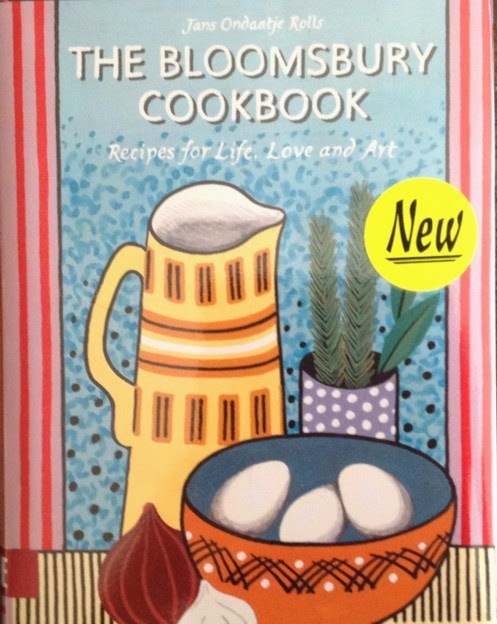 The Bloomsbury Cookbook is published by Thames & Hudson, so it goes without saying that it's beautifully produced & just a joy to look at. I have some more gorgeous books on the way to me at work so Part Two of this post will be along soon. I can always tell when autumn has arrived & winter's on the way because both Lucky & Phoebe spend a lot more time inside looking for cosy places to sleep. 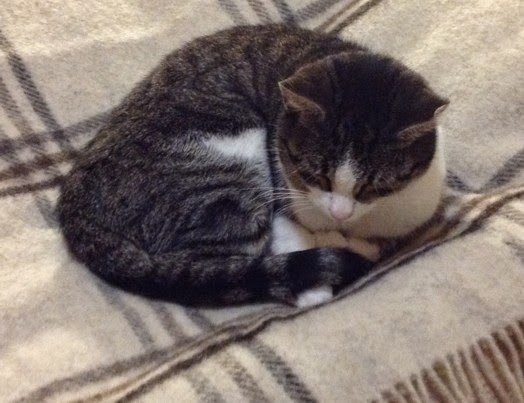 Lucky's favourite places will always be under a blanket or rug. This is her new favourite place. 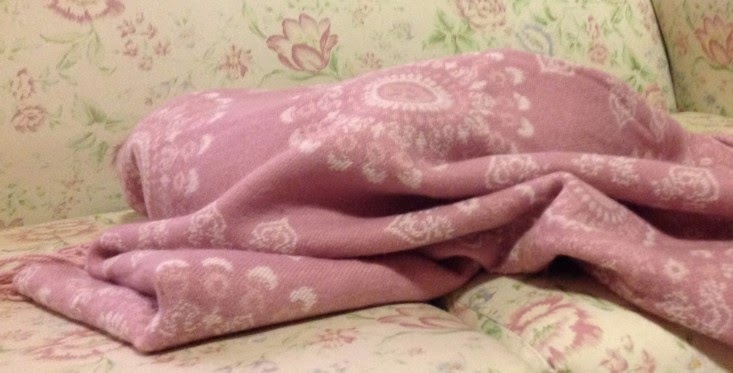 It always amazes me how she manages to roll herself up so snugly. She hasn't given up on my old dressing gown which she's loved since she first arrived. 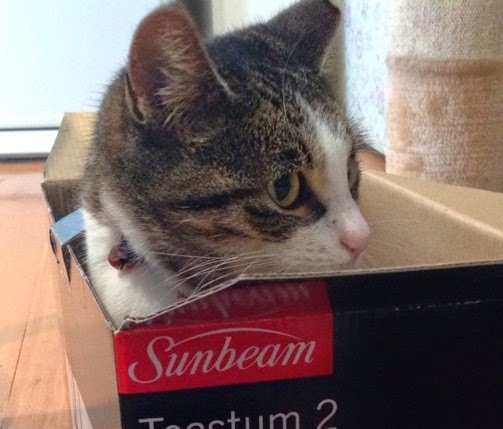 It was Abby's favourite place too, although she always snuggled down on top of it rather than underneath. 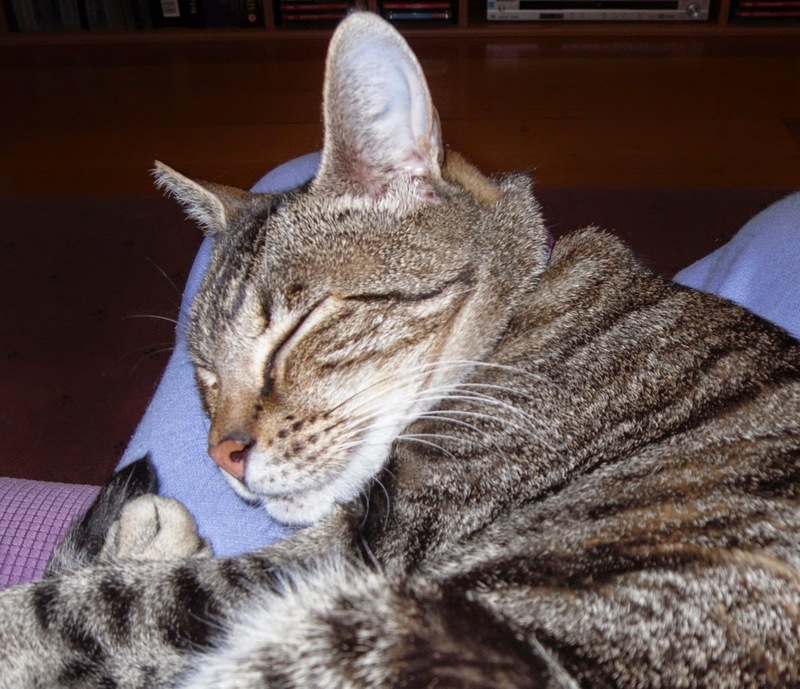 As soon as I sit down in the evening, Lucky's right there, impatiently sitting on the arm of the chair until I'm ready to provide her living electric blanket service. Sometimes, Phoebe beats her to it though. 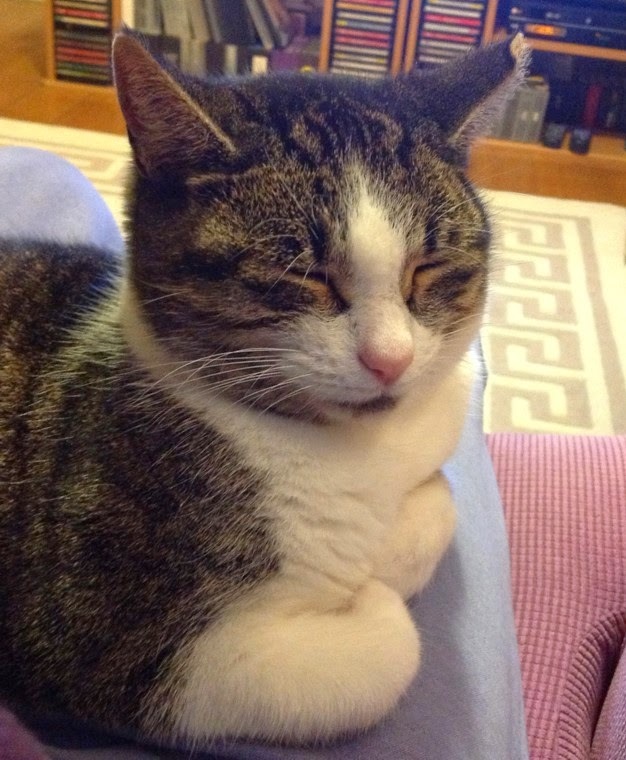 Phoebe also follows me around & whenever I sit down - at the computer, at breakfast - she's right there, holding her chin up for a tickle. As soon as she sees that I've brought out my Shetland wool blanket for the bed, she assumes I've done it for her benefit & sleeps there every night. 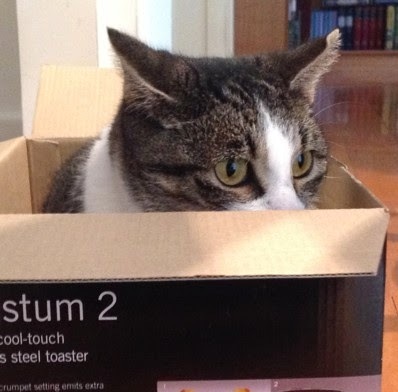 especially when she spied Lucky on the other side of the room & thought she was invisible because she was in the box. Lucky ignored her, as usual. It was ANZAC Day on Friday so this anonymous poem is appropriate to remember all those buried, not just at Gallipoli, but anywhere far from home. It's called The Graves at Gallipoli. I wonder when it was written. There's an echo of Wilfred Owen's Dulce et Decorum Est but that Latin tag would have been well-known so it may not necessarily be a reference to Owen. This poet, too, seems to use the reference seriously rather than ironically as Owen does. Surged upward from the sea. And the torn hills and those poor mounds be green. For his dear country, there his country is. In the high flush of youth and strength and pride. Of nobler futures. 'Twas for us they died. Keep we their memory green. And answered. Now beside the sea we rest. There have been many books written about the tragedy of the last Tsar of Russia, Nicholas II, & his family. I know, I've read an awful lot of them. 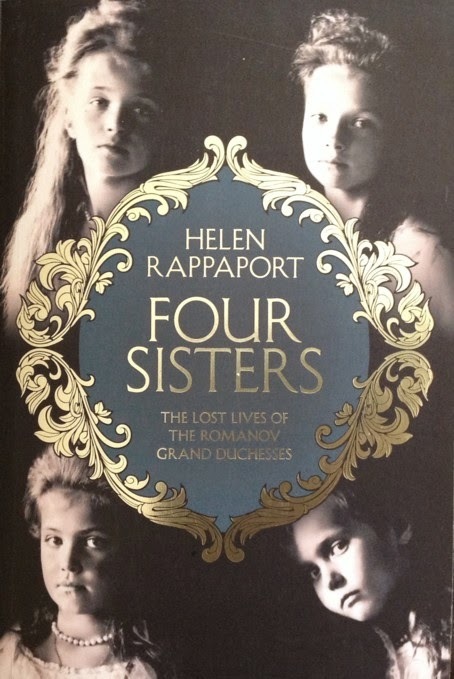 Helen Rappaport's new book, Four Sisters, has found a new way to tell the story, through the lives of the four Grand Duchesses, Olga, Tatiana, Maria & Anastasia. The story of the Romanovs has traditionally concentrated on the relationship between Nicholas & his German-born wife, Alexandra. They were fortunate in marrying for love & that love never failed them. They were also blessed with a happy family life. However, that is about the only good fortune they enjoyed. Alexandra was very shy & often appeared haughty. She had no time to acclimatise herself to Russia & Russian society. Nicholas became Tsar unexpectedly when his father, Alexander III, died at the age of only 49. Alix arrived to find her future father-in-law on his deathbed & her wedding was clouded by grief. The superstitious Russians said that the Tsar's bride had come to them behind a coffin. Alix converted to Russian Orthodoxy & embraced her religion with a fervour that was unusual among the aristocracy. She didn't enjoy society, unlike her popular mother-in-law, the Empress Dowager Maria Feodorovna, & she was often in bad health, so grand occasions were torture for her on several levels. Above all else, Alix was expected to provide an heir to the throne. She was soon pregnant & Olga was born the year after her marriage. However, as three more daughters followed, Alix's desperation to have a son led her to explore mysticism & quack doctors such as the notorious Maître Philippe. When she gave birth to the long-awaited Tsarevich, Alexey, in 1904, the joy of the family was clouded by the realisation that the baby suffered from haemophilia. Alix knew what this meant. Her mother, Alice, daughter of Queen Victoria, had been a carrier of the disease & one of Alix's brothers had died in childhood after his bleeding couldn't be stopped after a fall. Alexey's illness dominated the rest of Alix's life. It led her to isolate herself & her family more & more at Tsarskoe Selo, the Tsar's estate outside St Petersburg. It also led her to rely on healers such as Rasputin, who claimed to be able to help Alexey's suffering. There were many reasons for the fall of the Romanovs but the secrecy about Alexey's illness & the invisibility of the royal family surely contributed to the rumours that circulated among the aristocracy, especially after the outbreak of war in 1914. Helen Rappaport has told this familiar story but concentrates on the lives of the four Grand Duchesses who have often been dismissed as pretty girls in white dresses & big hats. Olga, Tatiana, Maria & Anastasia were never second best in their parents' eyes. However it was inevitable that their lives would be dominated by the need to protect & watch over Alexey & support Alix whose health was never robust. Alix's wish for privacy & distaste for society also led to her daughters leading very restricted lives. Their only social outings were tea parties at their Aunt Olga's house. They met very few people outside the household. Their tutors, servants, ladies-in-waiting & the sailors on the royal yacht, the Shtandart, were their companions. Above all, they had each other. Their self-contained way of life continued even as the girls became young women. Alix infantilised her daughters, referring to them as the Big Pair & the Little Pair & calling them her girlies in letters to Nicholas when Olga & Tatiana were in their 20s. They may have occasionally signed letters collectively as OTMA but they were individuals. Olga sometimes suffered from being the eldest & expected to set a good example to her siblings. Tatiana was the most beautiful of the girls but also the most enigmatic. Tall & elegant like her mother, she also shared Alix's reserve & could appear haughty. Maria suffered from being the middle child but was open hearted & the most Russian in temperament. Anastasia was the boisterous, unruly child, always ready to make a joke but a trial to her tutors. All of them were desperate to find out about the life outside, as they called it. Whenever they met strangers, especially young women, they would avidly question them about the parties they went to, the dresses they wore, what life was like outside the confines of the palace. Olga was 19 & Tatiana was 17 when WWI broke out. Along with Alix, they trained with the Red Cross & became nurses in a hospital set up at Tsarskoe Selo. In a way, they were liberated by the war. Finally they had worthwhile work to do & their dedication impressed their colleagues, the soldiers they nursed & the wider society. Photographs of the Grand Duchesses in their Red Cross uniforms were widely circulated. Tatiana was born to be a nurse although Olga eventually found that her health, both physical & mental, was undermined by the work. Maria & Anastasia had their own responsibilities as hospital visitors, helping the wounded men write letters home & hearing their stories. Unfortunately the war was not going well for Russia. Nicholas took over command of the troops & took Alexey with him to Headquarters which, again, allowed people to see the Tsarevich & get to know the royal family. It was too late & when revolution erupted in 1917, Nicholas abdicated. Initially there was some hope that the Romanovs would be allowed to go into exile, in England or to the Crimea, where they had always been so happy. Gradually these hopes faded & they were imprisoned, first at the Alexander Palace at Tsarskoe Selo, then in Siberia at Tobolsk & finally, Ekaterinburg where they were murdered in July 1918. Helen Rappaport has written an intensely moving book about the lives of four young women who never really had a chance to fulfill their great potential. Her research has uncovered much that was new to me, including some photographs that have never before been reproduced. She also discovered a collection of letters written by Anastasia from their Siberian imprisonment to her friend, Katya Zborovskya, that add to the picture of their lives at this time. Boredom & apprehension for the future, along with a sense of the love the family had for each other & their religious faith which never wavered. The story of the final weeks of the family's lives has been told by Rappaport in her earlier book, Ekaterinburg : the Last Days of the Romanovs (2008), as well as the horrific aftermath of the murders & she doesn't repeat those scenes here. I also felt more sympathy for Alexandra. Her life must have been dominated by her ill-health. She had five pregnancies in ten years as well as a phantom pregnancy & her health never recovered. She also had the never-ending fear for Alexey's health as well as the times of anguish when he was ill. There must also have been an element of guilt at being the transmitter of the disease that was torturing her son. It's understandable that she clutched at straws when she allowed herself to be convinced by faith healers but none the less tragic that she couldn't see what damage she was doing to her family. I loved Four Sisters. It's a story told with great sympathy & insight & makes the tragedy of the unlived lives & unfulfilled potential of the Romanov Grand Duchesses even more poignant. At an archaeological dig at Norwich Castle, once used as a jail & site of executions, forensic archaeologist Ruth Galloway discovers a skeleton that she believes could belong to the notorious 19th century baby farmer, Jemima Green. Green was known as Mother Hook because she had lost a hand & wore a hook instead. The remains Ruth has found are in the right place & have a hook where a hand should be. Ruth's boss, Phil, ever avid for publicity, is keen to participate in a TV program, Women Who Kill. Jemima, Mother Hook, hanged for the murder of five children in her care, is the perfect subject for the program. Ruth is uncomfortable with the sensationalist slant of the program (& with the thought of appearing on camera) but the new director, Dani White, seems to be trying to present a more nuanced view. She's up against the relentlessly tabloid style of the show's star, Corinna Lewis. DCI Harry Nelson is investigating a case that brings back memories of some of his most disturbing cases. A baby, David Donaldson, has been found dead in his cot. His two older siblings, Samuel & Isaac, also died young & what looked like a tragic coincidence, may be more sinister. David's mother, Liz, is now a suspect, & Nelson has to tread a fine line between investigating a possible murder & being seen as persecuting a grieving mother. Then, a child is abducted from her home & a note signed The Childminder, is found at the scene. The long ago case of Jemima Green seems to be reaching out to the present in some very disturbing ways. 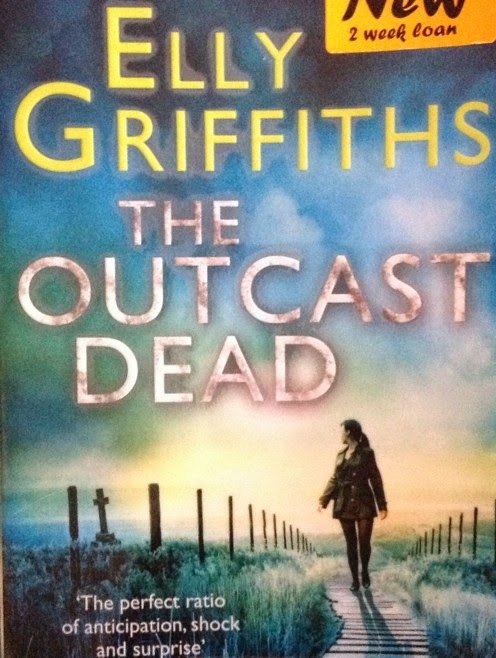 I'm a fan of this series & The Outcast Dead is one of the most involving cases so far. Ruth Galloway is such a sympathetic character. She had a brief affair with Nelson, resulting in the birth of her daughter, Kate. Nelson stayed with his wife but finds himself drawn back to Ruth & wanting to be involved in Kate's life. Ruth knows that Nelson will never leave his family but can't help thinking about him. Other relationships don't stand much of a chance. She meets American historian, Frank Barker, & although they have a lot in common, there's no real spark there for Ruth. Nelson's team also plays an important part in the series. Judy Johnson had an affair with Ruth's friend, Cathbad, & although she became pregnant, she went ahead with her wedding to Darren. Now she feels torn between her life with Darren & Michael & her love for Cathbad. Cathbad is one of my favourite characters. A Druid with a keen awareness of atmosphere & emotions that's almost psychic at times, he moved away to give Judy a chance to sort herself out but he's just as miserable as she is. Cathbad is convinced that Liz Donaldson is innocent & Ruth becomes involved in the present day case even as she learns more about Jemima Green & what really happened to the babies she cared for. The Outcast Dead is a great example of an intelligent police procedural with the added interest of the historical & archaeological investigation. As the series progresses, the interwoven relationships of the main characters become more integral to the plots & never more so than in this story which has some moments of real anguish. I'm not very good at working out whodunit & I was misled by at least one of the red herrings but the clues are there & even the psychic consulted by the police at Cathbad's insistence contributes to the very satisfying solution to the mystery. I'm still reading the poetry of WWI but, as it's Easter Sunday, I've chosen two poems written at Easter. 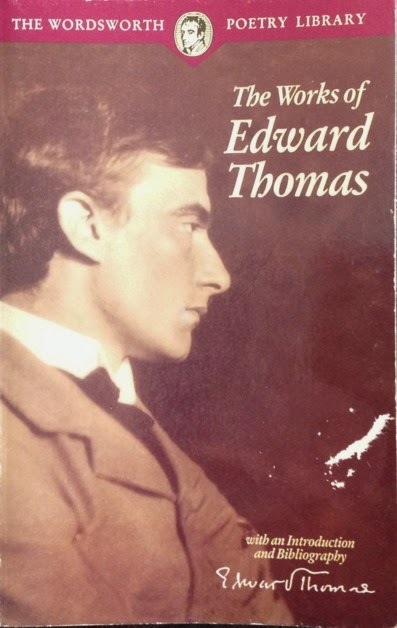 The first is by Edward Thomas & is called In Memoriam (Easter 1915). This title was given to the poem by an editor. The title on the manuscript was the less poetic 6.IV.15. 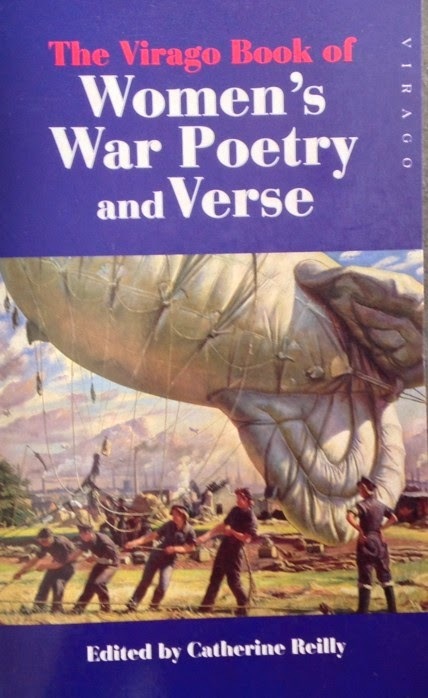 You can read more about it here in a post by Tim Kendall, President of the War Poets Association. Edward Thomas was killed at Arras on Easter Monday 1917 & his friend, Eleanor Farjeon, wrote this poem, Easter Monday (In Memoriam E.T.). The House on the Cliff (cover picture from here) is the story of a young girl who is left with nothing when her mother dies but finds herself & a future in an old house at the seaside. Elfrida Ware is trying to make a living as an actress. She's not a very good actress but her father, Frederick Thistlewood, was on the stage & her mother, Marjory, worked behind the scenes & there doesn't seem to be very much else that she can do. Frederick has long since left his family & Elfrida & her mother have been living precariously in a boarding house run by the flamboyant Miss Martineau. 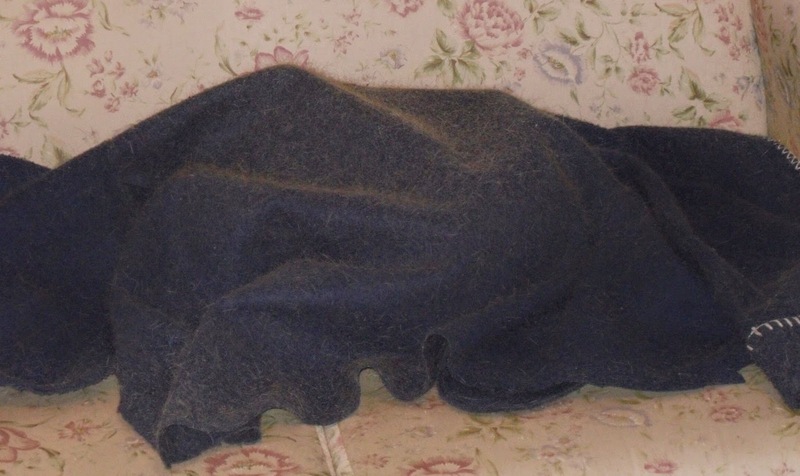 Marjory has just died & Elfrida's latest part is in a not very good play. She's only staying because of her infatuation with the leading man, Glen Siddons. Miss Martineau sees an advertisement in the paper from a lawyer looking for Marjory Thistlewood &, knowing Elfrida's story, encourages her to go along & find out what it's all about. Elfrida reluctantly goes to see Mr Robert Sandford & discovers that she has inherited Mountain Cross, her mother's family home. Marjory's parents had disowned her when she eloped with Frederick Thistlewood & her father never forgave her. After his death, her mother desperately wanted to get in touch but all Mr Sandford's enquiries were fruitless. Now, old Mrs Ware is dead & Elfrida has inherited Mountain Cross. Mr Sandford advises Elfrida to sell the house as there's very little money or land. Her grandfather had lost money on bad investments & sold off most of the land. Without the farmland, there's no way to make the house self-supporting. Elfrida decides to go down to Devonshire & see the house. She's missing her mother, unhappy at the theatre & Miss Martineau has advised her to forget about Glen. Leaving London seems to be the best plan so, Mr Sandford's nephew & junior partner, Ronnie, drives Elfrida down to see Mountain Cross. Elfrida immediately loves the house & is warmly welcomed by all the locals. The housekeeper, Emma Chowne & her husband, Ernie, are very welcoming & seem keen for her to stay on. Even when Elfrida confesses that she has no money, the Chownes offer to stay on for the use of their flat in the house & the chance for Ernie to raise pigs. Ernie was traumatised by his wartime experiences & doesn't speak. He feels uncomfortable anywhere but at Mountain Cross & Emma, who talks constantly, is happy to have them both settled in a familiar place. Elfrida soon settles in to life at Mountain Cross. She knows she will have very little income when her grandmother's estate is settled but she begins to make a few improvements, knowing in her heart that she will never be able to leave. Everyone in the village wants to make life easy for her. A local man offers to tidy up the overgrown copse & be paid in timber. She's welcomed by the local gentry who had been a little apprehensive about an actress coming among them. Of course, as soon as Elfrida puts on tweeds & a pearl necklace, she's one of them, even though she has grown up living a very different kind of life. This is a D E Stevenson novel, after all. Nothing truly awful ever happens (if you don't count Elfrida almost drowning, not once, but twice). Elfrida soon has several suitors. Ronnie Leighton is obviously smitten but conscious of the fact that he's very much a junior partner, has no money & is living with his widowed mother who expects him to marry a childhood friend called Anthea. Lucius Bebbington is a neighbour who is kind & helpful with gardening & then Glen Siddons arrives with his neglected young son, Patrick, in tow & settles down for a visit. She even has a visit from her cousin, Walter Whitgreave, who has lived in Canada most of his life & was once considered to be old Mr Ware's heir. Elfrida's lack of money is always there in the background but there's a fairytale ending that puts everything right. The House on the Cliff is a gentle story with all the elements that I enjoy in D E Stevenson's books. I especially loved the house. 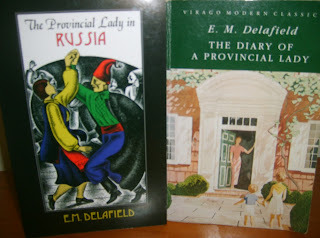 Books with houses in them always interest me & even though Elfrida doesn't transform the house, the house, the countryside, the sea & the people she meets transform her from a lonely, tired waif into a young woman with a future, a home & a family. The Chownes are also wonderful characters. Old family retainers who know all the family secrets & are fiercely loyal to Elfrida from the moment she arrives. 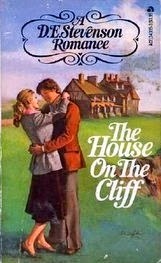 The House on the Cliff was published in 1966 but the atmosphere is very 1930s. This seems to be true of all the Stevensons I've read so far. Unless they're set very specifically during the war, they all seem to be set in the 30s. I read The House on the Cliff thanks to Open Library. I've only just discovered Open Library thanks to a mention in this review of Stevenson's The English Air at Fleur's blog. When I investigated, I found many ebooks available for loan, including several Stevensons that I haven't read & that are out of print. It's free to sign up & you can read the EPub or PDF ebooks on an ereader that uses Adobe Digital Editions or, if you search on an iPad or tablet, you can read the ebooks in iBooks or Overdrive (thanks to a YouTube video for helping me with this! What did we ever do without YouTube?) I now have yet another wishlist in Open Library with titles by Stevenson, R F Delderfield, Ruth Adam, Angela Thirkell, Catherine Gaskin & Elizabeth Goudge (including her autobiography, The Joy of the Snow, recently read by Cornflower). The books have been scanned from library copies so there are a few glitches (y came out as v) but The House on the Cliff was perfectly readable & I'm so glad to have had a chance to read it. 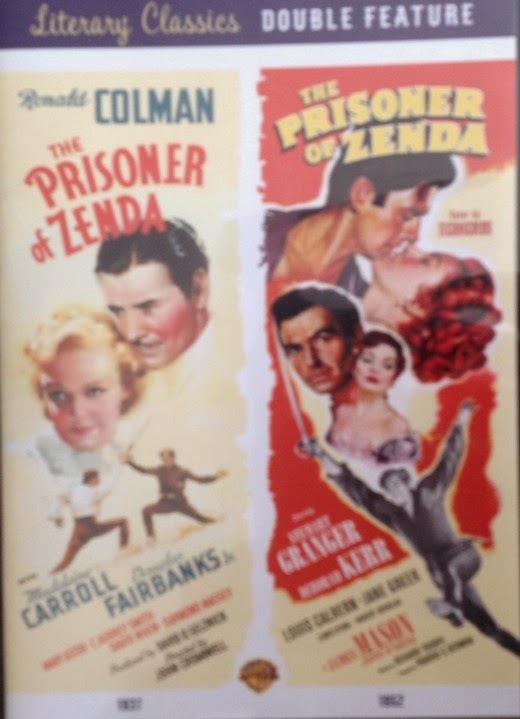 A couple of weeks ago, I watched the Ronald Colman version of The Prisoner of Zenda. I loved the movie so much that I was inspired to pick up the sequel, Rupert of Hentzau (picture from here). The story picks up three years from the ending of Zenda. Rudolf Rassendyll has returned to England, leaving his cousin to rule as Rudolf V & to marry Princess Flavia. Flavia is unhappy but dutiful. She has never forgotten Rudolf & is still in love with him. Every year, Fritz von Tarlenheim, the narrator of the story & one of the inner circle who know about the events around the King's coronation, takes a red rose from Flavia to Rudolf. This is the only contact they have. This year, she decides to write a letter as well. The letter is stolen by Rupert of Hentzau, the dashing adventurer who was exiled at the end of the previous story. Rupert has never forgiven Rudolf or the King & has been waiting for a chance for revenge. Rupert needs to get the letter to the King, hoping that he will divorce or exile Flavia. He enlists his hero-worshipping young cousin, the Count of Luzau-Rischeneim, to take the letter to the King. Fritz & Colonel Sapt realise the peril that the Queen is in & Rudolf arrives in Ruritania to defend the Queen's honour & face his old enemy once more. The King has never recovered from imprisonment in the castle of Zenda & is peevish & weak. His character hasn't been improved by his adversity or the sterling example Rudolf presented on the throne. If anything, he has grown to resent any mention of Rudolf's name. Sapt & Fritz serve him loyally but they can't help but regret that Rudolf couldn't be King. Rudolf's arrival is the beginning of a convoluted plot where he once again impersonates the King so as to receive Rischenheim & get possession of the letter. Sapt has convinced the King to go to his hunting lodge. However, Rupert smells a rat & pursues the King to the lodge with devastating results. Sapt & Rudolf's servant, James, must come up with an audacious plan without any way of letting Rudolf & Flavia know what has happened & what they plan to do. Rudolf, meanwhile, is in the capital, Strelsau. When he is recognized as the King, he has no choice but to continue his impersonation. He constructs an ingenious plot & discovers Rupert's hiding place in the city. The final encounter between these two is swashbuckling at its best. Rudolf's sense of honour & fair play would seem to be no match for Rupert's wily tricks & the sword fight is very tense. The denouement is sad & tragic but inevitable. There's really no other way for the story to end & there's a certain rightness in the way the story closes. I wanted to see if a movie had ever been made of it & imdb tells me that there were two movies in 1915 & 1923. The 1964 TV series interests me more, with George Baker (Inspector Wexford) as Rudolf & there was also a 1957 TV movie with Paul Eddington (Yes, Minister) as Rischenheim. Still, if I feel in need of more swashbuckling, I can always watch the 1952 version of The Prisoner of Zenda with Stewart Granger & Deborah Kerr. I love Stewart Granger but I don't think anyone could be better than Ronald Colman in the role. He has the most beautiful speaking voice & such an air of nobility. The supporting cast is wonderful from David Niven as Fritz, Raymond Massey as Black Michael, to one of my favourites, C Aubrey Smith, as Sapt. Douglas Fairbanks Jr is so dashing as Rupert in the early version, too. James Mason is another of my favourite actors but I don't think he can buckle his swash the way Douglas can. Although his Jerry Jackson in The Wicked Lady is pretty dashing... I can see myself spending several evenings with my favourite leading men. 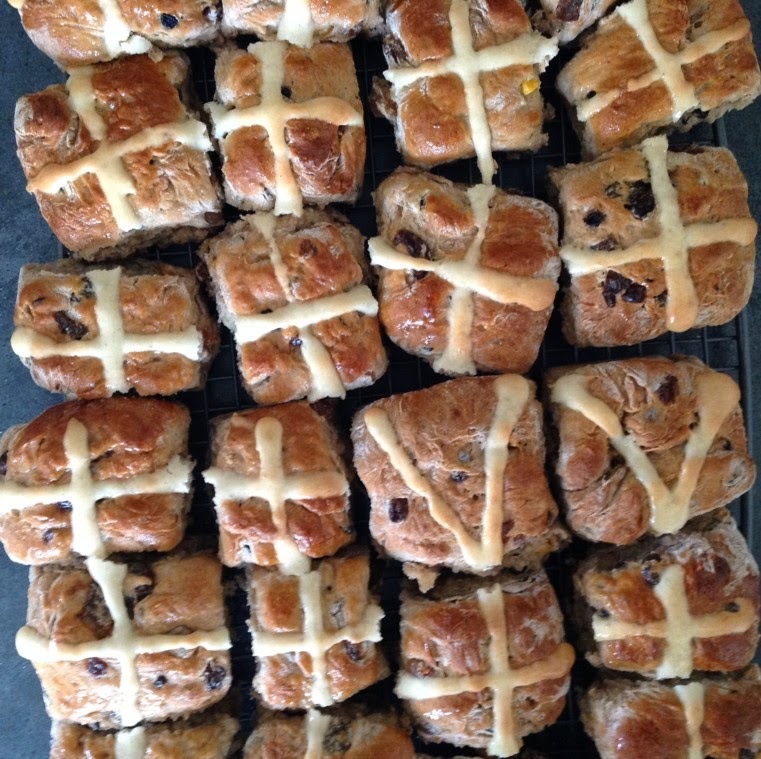 Every Easter I make hot cross buns for morning tea at work & yesterday I made this batch. The buns with the V on them are for a couple of vegan colleagues. They're exactly the same, just without the egg wash. The baker's privilege is to have a small bun just out of the oven so I can report that they're delicious. I say this every year but I don't know why I don't make fruit buns at any other time of the year. They'd be just as yummy without the crosses but I know I won't make another batch until next Easter. 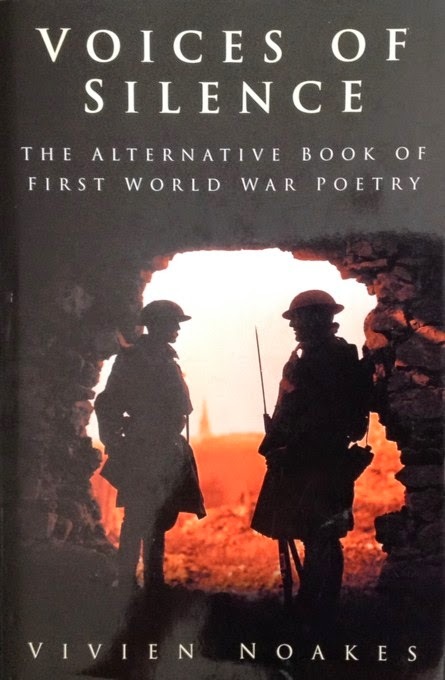 Still reading the poetry of WWI but this is from another anthology on my shelves, Voices of Silence : the alternative book of First World War poetry by Vivien Noakes. I've literally just picked it up from the shelf &, flicking through it, came across the name of Carola Oman. She was a friend of Georgette Heyer & I remembered reading about her in Jennifer Kloester's biography of Heyer last year. Carola Oman was a Red Cross nurse during both wars. This poem is called Night Duty in the Station. By the way, turkis in the last stanza is an obsolete form of turquoise. I looked it up as I'd never seen the word before. Into the dark it passes, heavily straining. Shattering on the points the engine stutters. Each truck the same moves on. Drifts where the deep fires flicker. The last truck wags... it is gone. Were you calling me last? The Arcadian fields are drugged with blood and clay. And is Romance not past? The station in this watch seems full of ghosts. About the barriers in a ceaseless drift. Unready, and again, into the night. The windows in the Post Office are lit with olive gold. And a transparent city shines upon a magic mount. Katie Fforde's books are always a treat, as comforting as a cup of tea & a Sunday afternoon in my favourite reading chair. 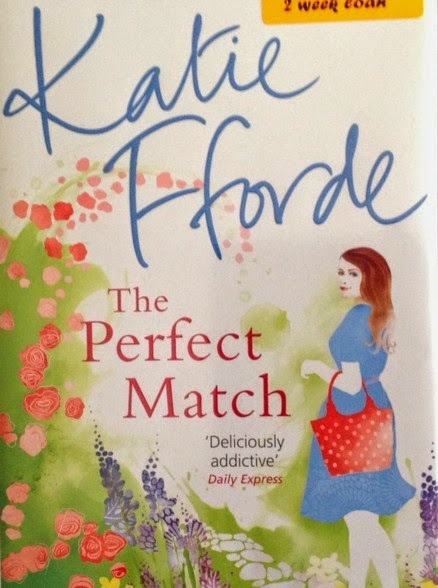 Her new novel, The Perfect Match, delivers all the bucolic Englishness we've come to expect although I didn't find the main romance quite as involving as usual this time around. Bella Castle is a real estate agent in a small country town. She left her home town three years before after falling in love with a married man. Although their relationship consisted of nothing but flirting over the photocopier & a kiss under the mistletoe, once she realised Dominic was married & that his wife was pregnant, Bella left. Now, she has her life completely on track. She lives with her godmother, Alice, loves her job & is practically engaged to her boss, Nevil. Bella is the kindest, most considerate & altruistic real estate agent I've ever met in fiction. She goes to endless trouble with picky clients & becomes friends with an elderly lady, Jane Langley, who doesn't want to sell her big, inconvenient house but is worried about the future when she can no longer manage the house & her beautiful garden. Nevil imagines that Bella's visits to Jane are a way of softening her up for the eventual sale of her house but Bella is genuinely concerned for Jane, who becomes a friend. Imagine Bella's dismay when Jane's nephew comes to visit & he turns out to be Dominic Thane, the man she left her previous job & life for. Bella is already having doubts about her relationship with Nevil & her doubts increase when she begins to suspect that he's involved in some dodgy property deals. Her decision to look for evidence of these deals leads her into potential danger. 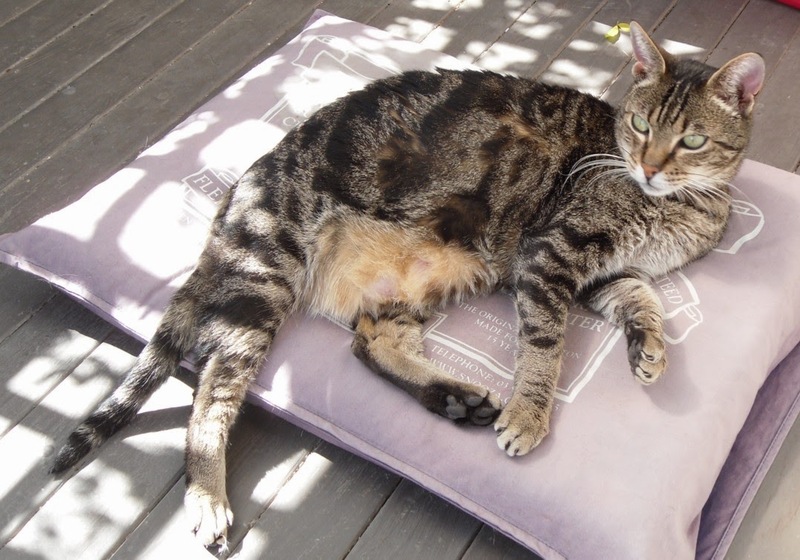 Bella's godmother, Alice, is in her sixties, happy with her life although she is starting to get itchy feet in her comfortable domesticity after a life of travel. When she meets Michael on the train one day, there's an immediate attraction although she's reluctant to make too much of it as she's several years older than he is. However, Michael isn't deterred & their relationship moves quickly. Michael's two daughters are not so welcoming & Alice has to make some crucial decisions about her future. Dominic could never understand why Bella left so abruptly & believes the rumours at their workplace that she had covered up for his wife, Celine, who was having an affair. Their marriage broke up soon afterwards. Dominic isn't happy to discover that Bella is his aunt's friend & Bella is dismayed to realise that she is still in love with Dominic. Their friendship slowly develops as misunderstandings are cleared away & Bella asks Dominic's help with her investigations into Nevil's shifty dealings. The Perfect Match is a lovely book to read on a Sunday afternoon although I don't think it's as good as her earlier novels. 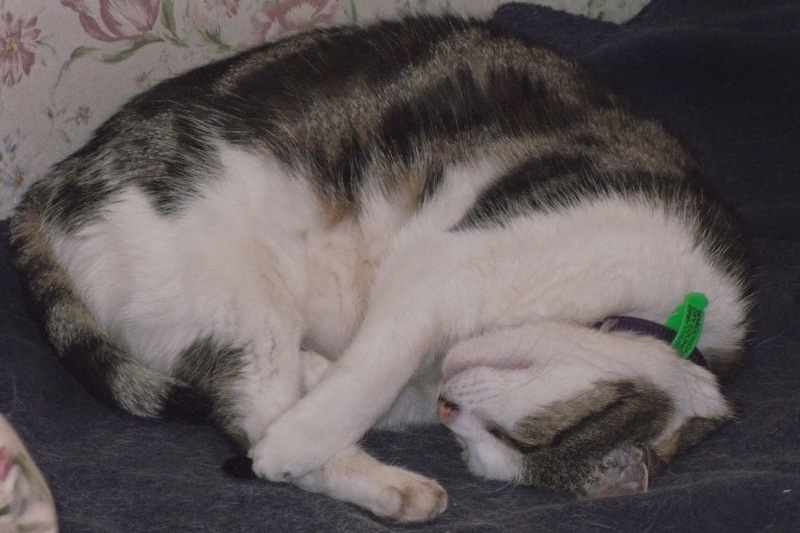 Bella is a sweet girl but I couldn't understand why she was still with the odious Nevil. He might have built up her confidence when she first arrived but she really only seems to be still with him because she loves her job & knows he'd sack her if she broke up with him. Every word he says & every assumption he makes just shows that they're poles apart in values, morals & everything that matters. It surely didn't take her three years & the arrival of Dominic to work this out. Bella & Dominic's romance never really gets off the ground, they have so many obstacles to get over. I did love Alice & Michael's story & this reminds what I love about Katie Fforde's earlier novels. They were about older women still living interesting lives, having relationships & fitting all that in with busy lives. I believed in Alice where I didn't really believe in Bella. 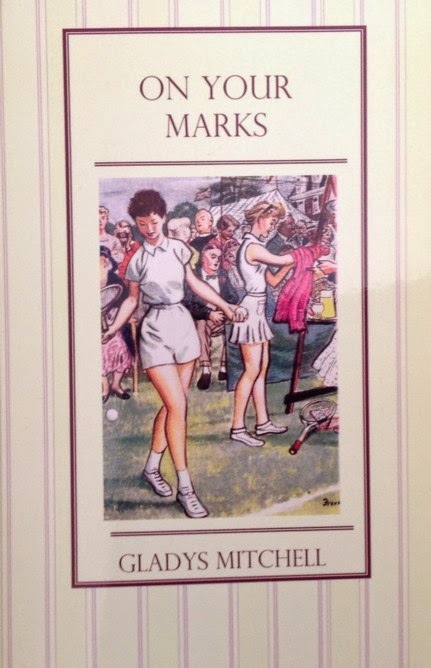 On Your Marks is a girls career novel set in a physical training college like the one in Miss Pym Disposes. Being Gladys Mitchell, the author can't resist a few mysteries - who drained the swimming pool? Who sawed through the hockey goal posts? - but it's really just a Jolly Good Read as Kay Whalley says in her Introduction to the Greyladies edition. Lesley Scott is about to begin three years training at Falcons Physical Training College where she hopes to qualify as a PE teacher. Lesley is tall, attractive, kind, good at games, academic work & a born organiser. She is obviously going to succeed but not be so disgustingly perfect that the reader can't empathize with her. On her first day she meets Frankie Allinson, short, tubby, a demon tennis player who was destined for Wimbledon but her family couldn't afford it & someone who finds trouble wherever it may be. The two girls soon become best friends & the three years of their training combine several crises (usually involving Frankie) with lots of hard work & so much sport that I was exhausted just reading about it. 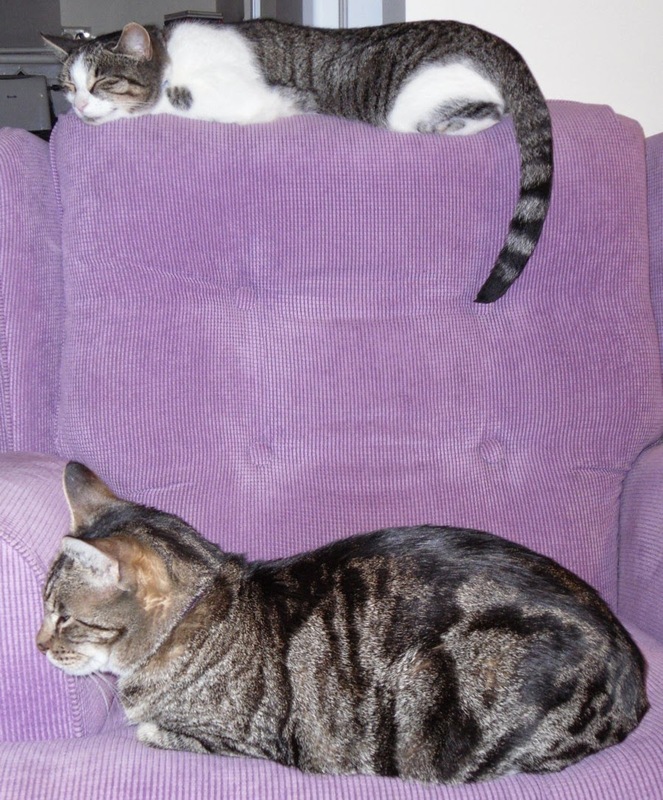 The story also follows Lesley & Frankie to their first post in a school. Gladys Mitchell taught games in various schools throughout her career & knows the school background well. I've never been much of a fan of school stories but I did love The Naughtiest Girl in the School by Enid Blyton & there are similarities here, even though the "girls" at Falcons are really young women, training for a career. The school is divided into Houses, all with nicknames - Leander (Leo's, where Lesley & Frankie live), Atalanta's (Auntie's), Pheidippides (Fido's) & the fourth house is known as Prin's because that's where the Principal, Miss Betts, lives. Inter-House games & competitions are vital to instil the appropriate spirit & keep the students up to scratch. The atmosphere of the 1950s is everywhere, although in some ways it could be pre-war. Lights out at 11pm & no young men from the local Technical College allowed to the dances. Divided skirts & only one visitor allowed to sit on the bed. I admit I was slightly shocked when one of the mistresses offers Lesley a cigarette but I was amazed when one of the students, a Miss Plumstead "came top of the College and took herself off to a job in India, where she was paid a fabulous salary by the local rajah for teaching English games in his State school and coaching his younger wives in tennis and badminton." That's what I mean by a pre-war atmosphere! I was also fascinated by the reference to a train as a Puffing Billy. Here in Melbourne, Puffing Billy means only one thing, a steam train that runs through the Dandenong Ranges & is a big tourist attraction. I had no idea that the name was used for steam trains in general. As one of the mistresses at Falcons might have said, "Even the lightest literature can be educational, girls." There's not a bit of romance until the last couple of pages although I did catch a hint of this early in the book. The mysteries I mentioned above are tackled by the girls led by Lesley as their formidable general, showing tactical & leadership skills worthy of Napoleon or Wellington. My favourite scene was the fire in the Sanitorium (on the third floor, no less) where several injured girls (broken bones & sprains abound in the college) are encouraged to jump on to blankets & the reluctant ones are rescued by Frankie climbing up a pyramid of mistresses & girls & literally shoving one girl with a broken collarbone out of the window. Gymnastics are another mainstay of the curriculum. I enjoyed On Your Marks very much. It was a light read but full of engaging characters & the ultimate satisfaction of just reading about all that exertion from the comfort of my reading chair. If you have the Greyladies edition, don't skip Kay Whalley's Introduction (although don't read it until afterwards). She makes all the points I've made here & anticipated my every thought about the book, the plot & the characters & expresses it all with great humour & affection. When I came across this poem, I thought the author's name was familiar. Olivia FitzRoy was an author of children's books (among many other titles) & some of her books have been reprinted by Fidra. She enlisted in the WRNS during WWII & her pilot boyfriend was killed in Singapore in 1945. After the war, she spent time travelling with a circus, collecting material for a book & rented a croft in Scotland for a few years. She married & had two daughters but died, aged only 48, in 1969. This poem, When He Is Flying, must reflect not only FitzRoy's own experience but the experiences of so many people waiting for news of a loved one. She must have only been in her early 20s when she wrote this poem but the refrain "when I was young" & the weary tone of the speaker expresses the constant fear & dread that Death was just waiting for His moment & His coming was inevitable - if not for you & yours, then for someone else. And lays his cold unhurried hand upon my heart. I mentioned a couple of months ago when I was reviewing Josephine Tey's Miss Pym Disposes, that I love a mystery set in a closed community. Several people have also recommended Louise Penny's series of police procedurals set in Canada. 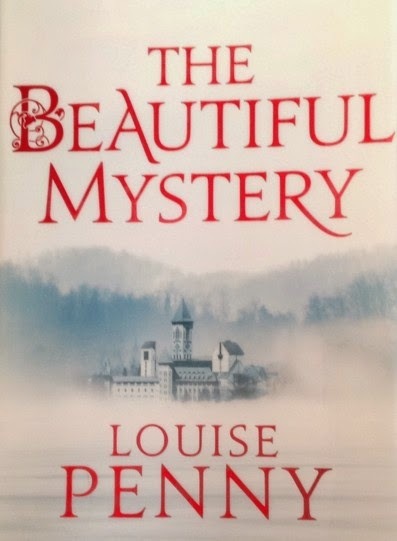 So, instead of starting at the beginning of the series (which is what I'd normally do) I thought I'd read The Beautiful Mystery, which is set in a Gilbertine monastery in a remote wilderness. Sûreté officers Chief Inspector Armand Gamache & Inspector Jean-Guy Beauvoir are called to the monastery, Saint-Gilbert-Entre-les-Loups (St Gilbert among the wolves), when the body of the Prior & Choirmaster, Frère Mathieu, is found in the Abbot's private garden. Frère Mathieu had been killed by a blow from a heavy object & he was curled up, clutching a piece of parchment with Gregorian chant written on it. The abbot, Dom Philippe, & all the monks seem shocked by the murder & almost as horrified by the intrusion of the police into their sanctuary. The monastery had been hidden, unknown for centuries, until a recording of the monks singing their Gregorian chants, found its way into the outside world & caused a sensation. Since then, the monks had almost been under siege by tourists & the media. It soon becomes obvious that the recording has brought benefits & disadvantages. The money from the recording has paid for geothermal heating & solar power but the intrusion of the outside world & the temptation to leave their enclosed order & go out into the world, giving concerts & interviews, has split the community. The monks have been divided into Abbot's men, who don't want to leave their seclusion & the Prior's men, who want to take the opportunity to secure the community's finances & spread the word of God through their music. Gamache & Beauvoir must disentangle the possible motives of these men who follow a vow of silence which makes them extraordinarily observant of each other & of the police. As they get to know the monks - Frère Raymond, who looks after the practicalities of the geothermal plant, Frère Charles, the doctor, Frère Simon, the abbot's secretary & Frère Luc, the youngest & newest member of the congregation, who is the porter - they also begin to absorb the atmosphere of the monastery & the division of the day into periods of prayer & plainchant signalled by bells. The arrival of Gamache's superior officer, Superintendent Francoeur, leads to increased tension as Sûreté departmental politics & old enmities are unleashed. Francoeur & Gamache are bitter enemies & Francoeur is determined to undermine Gamache's position, both by arriving to oversee the investigation & by playing on Beauvoir's insecurities. Some months before, Gamache had led a group of his agents into a situation in which several of them were killed & he & Beauvoir were severely injured. 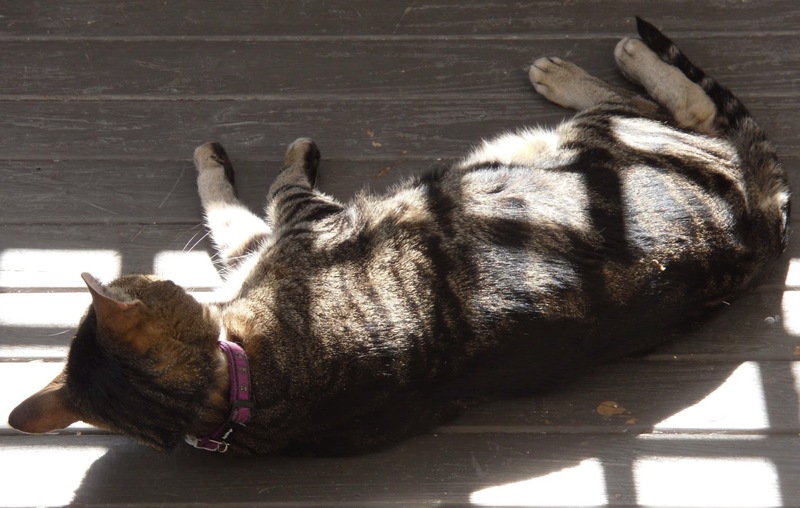 Beauvoir became addicted to painkillers & has only recently recovered. Beauvoir has also fallen in love with Gamache's daughter, Annie, & they're waiting for the right moment to tell Gamache & his wife. The Beautiful Mystery is an absorbing mystery. I loved the setting. The monastery in the wilderness is beautifully described. I could see the corridors, the chapel, the gardens & the tiny cells where the monks slept. I also loved all the musical background that informed the plot. The beautiful mystery of the title is the name that was given to the sublime sounds of the Gregorian chants. The monks of Saint-Gilbert-Entre-les-Loups have taken the art of the chant to sublime heights & I was as enchanted as Gamache by the experience of hearing them, even if it was only in my mind. Gamache is a very sympathetic investigator who obviously cares about his whole team & the integrity of the Sûreté as a whole. Louise Penny does a great job of filling in new readers who haven't read the earlier books in the series. I felt I knew exactly what was going on with Gamache & Francoeur, their past relationship & the backstory to the hatred between them as well as the father-son relationship between Gamache & Beauvoir. My only quibble with the book is the length. 500pp is just too long for a police procedural. I can't think of any mystery novel that needs to be more than 300pp. I stopped reading Elizabeth George because every novel was longer than the last & the investigative element became swamped in the minutiae of the lives of the protagonists. I enjoy following the characters from one novel to the next but sometimes the mystery is lost. However, The Beautiful Mystery is an excellent example of the closed community crime novel & there is much to enjoy in this story of monks, music & murder. 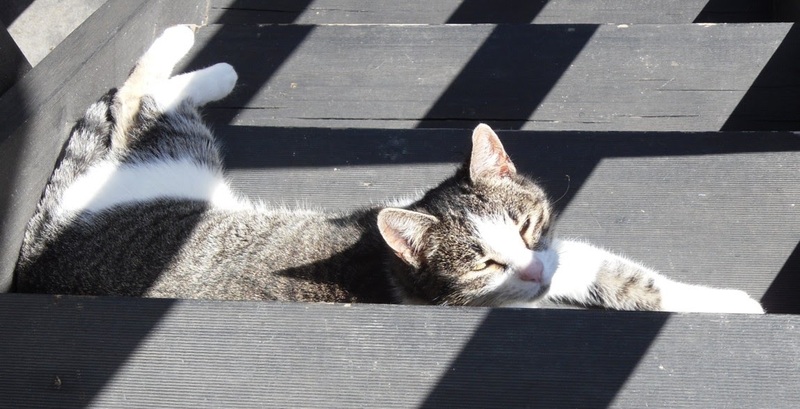 & roll around in the sunny patterns from the trellis on the back porch. & one from the bottom of the steps. After all, why choose somewhere safe to sleep (such as her fluffy purple velvet bed) when she can snooze on a step where one roll backwards would send her falling to the concrete beneath? Probably the same reason she likes to sleep on the back of my chair (unlike Lucky, who takes the sensible option) & climb on the rooftops. She's a daredevil.